Join Natasha Lenon and I for our FIFTH annual Relax & Renew Yoga Retreat at Manitoba’s beautiful Hecla Island! Enjoy a weekend of yoga, meditation, kirtan, nature walks, mineral pools, and self-care. 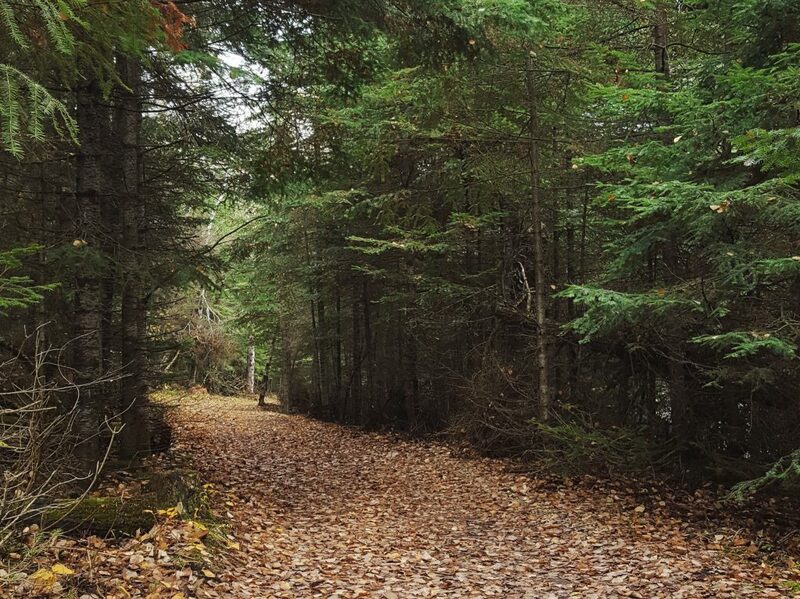 Fall is a wonderful time for introspection and reflecting on the past year’s events and experiences. We hope you can join us for this nurturing and rejuvenating weekend retreat. We have been lucky enough to sell out this retreat for the past four years, so if you have been thinking of coming, sign up soon! The retreat includes Friday dinner and officially starts after dinner, and will end around lunchtime on Sunday (lunch is included). An itinerary is not released prior to the retreat to encourage participants to take things one step at a time. Please be assured that the pace of the retreat will be steady and relaxed, with plenty of time between activities. All yoga classes will be accessible to both a beginner and long-time practitioner. 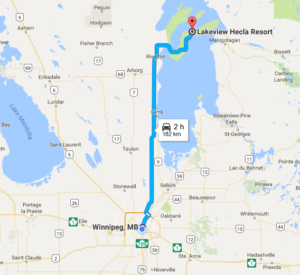 Hecla Island Resort is about a two hour drive north of Winnipeg. All prices include GST, meals, accommodations, and use of the Salka mineral pools. Payment is made directly to Natasha or Adrienne Shum. Please make cheques payable to Adrienne Shum. E-transfers can also be sent (to Adrienne only). Please read the payment and cancellation policy below. Upon payment, please fill out this online registration form. If you would like to book a spa treatment, there will be time available during the retreat or on the Sunday afternoon after the retreat ends. Please visit the Hecla Resort website for more information. Questions? Feel free to contact Natasha [njlenon(at)gmail(dot)com] or Adrienne! Payment in full is required to secure your spot. If you are interested in a double room, it is your responsibility to find a roommate. before July 1st, 2019, you will receive a full refund less an $100 administrative fee. On July 1st and after, there is no refund. Payment plans are available upon request and considered on a case-by-case basis. All plans considered will consist of a maximum of 3 payment instalments. All plans considered must submit complete payment within 6 weeks of start date. Natasha and Adrienne take great care to organise and plan this retreat in the hopes of providing benefit to all; please be considerate of their energy and time if you choose to make this request. Registration closes in early September 2019 – spots usually fill up before then, so don’t wait too long! Update: this retreat is SOLD OUT and registration is now closed. Thank you for your interest! Please sign up for my newsletter to get notified about future retreats. 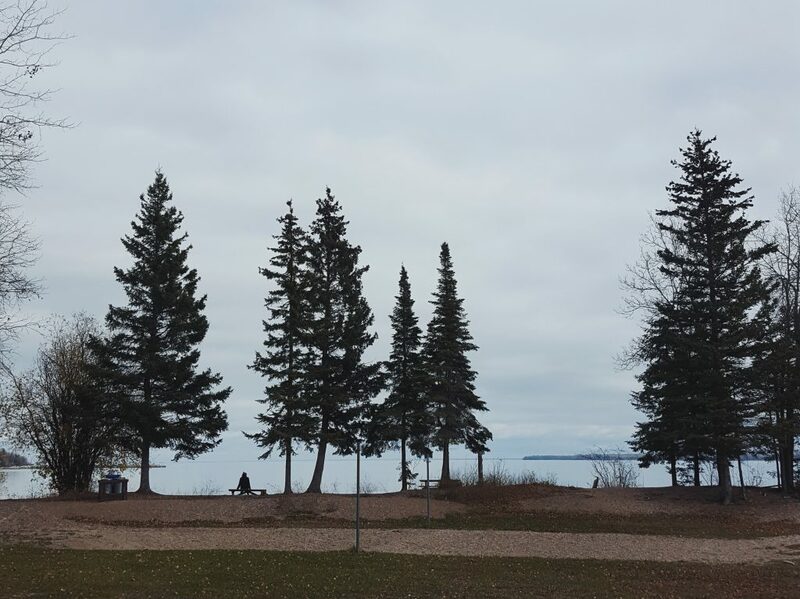 Join Natasha Lenon and I for our fourth annual Relax & Renew Yoga Retreat at beautiful Hecla Island! Enjoy a weekend of yoga, meditation, kirtan, nature walks, mineral pools, and self-care. Fall is a wonderful time for introspection and reflecting on the past year’s events and experiences. We hope you can join us for this nurturing and rejuvenating weekend retreat. We have been lucky enough to sell out this retreat for the past two years, so if you have been thinking of coming, sign up soon! Questions? Feel free to contact Natasha or Adrienne! before July 1st, 2018, you will receive a full refund less an $100 administrative fee. Engage in a transformative process that is based on the healing traditions of Ayurveda and yoga to restore balance, wellness and clarity. Find a deeper connection to yourself and realign with what nourishes and serves you. As complementary practices, Ayurveda and yoga seek to address the well-being of an individual’s body, mind and spirit. According to Ayurveda, the change of seasons is the natural time to reset ourselves, boost Agni (metabolism), and remove Ama (toxins). The 2-hour workshop lays the groundwork for understanding the principles of Ayurveda and covers the methodology of a 5-day cleanse. Thereafter, online content (recipes, guided meditation recordings, and more!) will be made accessible exclusively to workshop participants to support them on their continuing journey. For each day, participants will be presented a practice (sadhana) to incorporate into their daily routine. Discover practices that are sustainable, simple, and restorative. This is an opportunity to take time for ourselves and listen carefully to the feedback that our bodies provide. 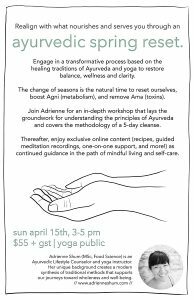 The focus will be on integrating Ayurvedic eating principles (including recipes), mindfulness, and self-reflection to help reset the body-mind as we move into a new season. This practice is excellent for both beginners and seasoned pros; find support and community in embarking on this journey together. If you have participated in a cleanse with Adrienne before, please note that this is an evolved format. Adrienne continually strives to advance her understanding of Ayurveda, and this updated program reflects deeper insights. Limited space left in our Costa Rica retreat! A few extra spots have opened up in our Journey to Paradise Yoga Retreat happening February 11-18, 2018 at Luna Lodge in Costa Rica! If you are interested, email me now to snag your spot! Visit the Retreats page to get all the details.